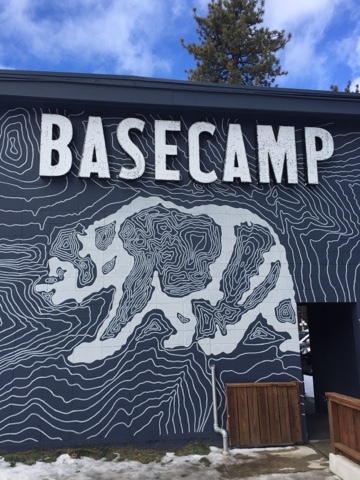 I spent last weekend at one of my favorite hotels in Tahoe, Basecamp. My birthday was coming up so my boyfriend J.P. and I decided that the weekend before was the perfect time to get out of the city and celebrate a little early. Tahoe is close enough that we can make a quick weekend trip without needing to plan too far ahead. We jumped in the car Friday night and made it up before midnight. What I love about this hotel is that it’s great both for frequent skiers who want to be up early and out on the slopes and is also great for the snow bunnies who want to relax and enjoy the snowy view. Since J.P. and I were still getting over some holiday colds, we opted to both be snow bunnies and just enjoy the winter weather. We packed a bunch of books, packs of cards, our favorite snacks and made sure to download a few new movies. The aesthetic of the hotel is definitely hipster and I love it. 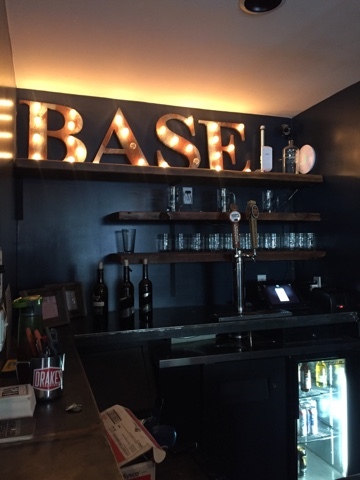 We went up the year previous and we’re happy to hear about their new expansion, which included a whole new beer garden and patio. 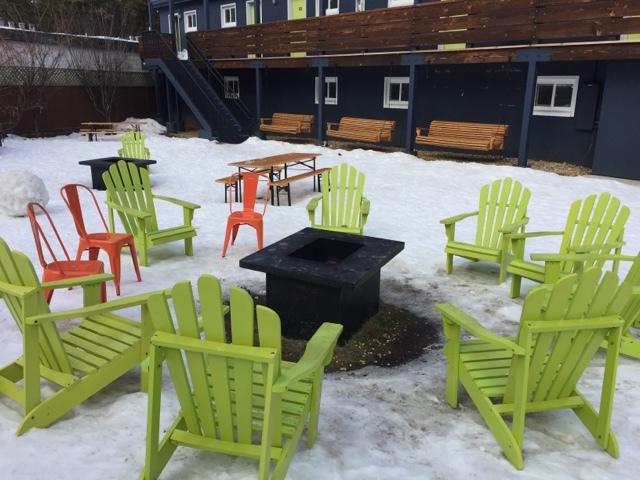 With outdoor firepits, indoor ping pong table and a tasty menu of beer and brats, it was the perfect spot for us to spend the day. The beer garden has these big windows so I got to spend the day watching excited kids have an epic snowball fight, seeing the flurries fall and killing it at ping pong. Not a bad view for a Saturday morning in the snow. The hotel is right by Heavenly so it’s perfect for all the skiers/boarders out there. They have a continental breakfast with belgian waffles, oatmeal, toast and granola, but they also have a small breakfast menu too. Saturday evening and the beer garden was a little loud for me to read, but I still wanted to enjoy a glass of wine so I opted to head into the main lobby of the hotel which has huge, comfy couches, a cozy fireplace and its own little bar. I grabbed a glass of red wine and settled in to finish my book. Looking to relax, this was absolutely the perfect setting for me. I definitely can’t wait to head back for another relaxing weekend. So amazing place and photos! Love it all! I haven't been to South Lake Tahoe for years but I remember it as being so much fun. I love the picture of the beer garden. The snow on the mountains is so pretty. I haven't seen snow in years (I live in Los Angeles) so this makes me nostalgic for fun, winter getaways. Sounds like you had a great time! I've never been to Tahoe but I think it would be so much fun! What a cute area! Looks like your weekend was such a grand time. I'm from California, but have never been to Lake Tahoe – now I really want to go! 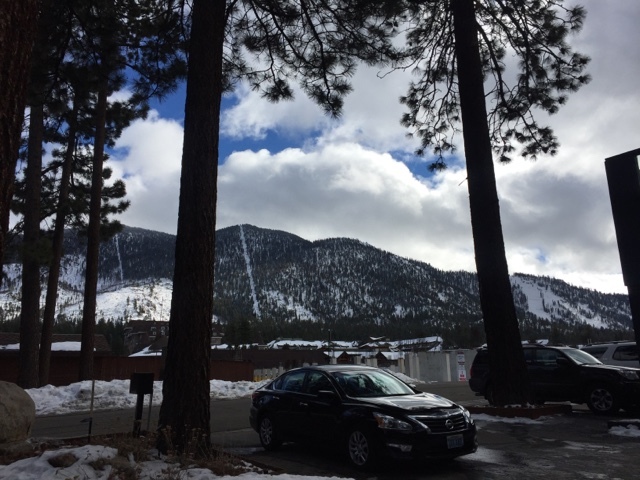 My husband and I went to South Lake Tahoe in December 2014 and it was beautiful! We love going to Tahoe, but we've never gone to just relax in the winter. It's a fun town with amazing views! This is somewhere I really want to visit someday! 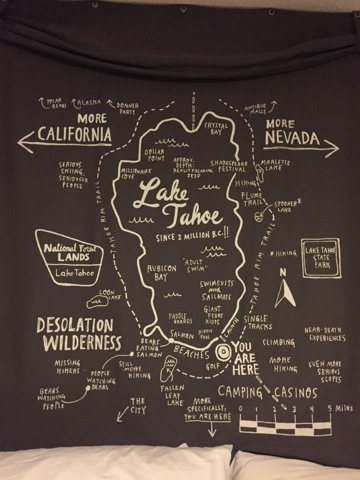 I definitely want to visit Lake Tahoe after reading your adventures and love map wall of Lake Tahoe!